Barrier-free design is an idea that is commonly misunderstood. Or, at least, is used interchangeably with Universal Design or something conforming to ADA standards. Where Universal Design is about something (in this case, your home) being created so it is easier to use by the most number of people, barrier-free design is about access. Barrier-free is a way of thinking about design to remove or replace the things that keep a person from accessing or using their home the way they need to. Barrier-free design dictates how easily you get into and move around in your home, as well as how you approach the things in your home (such as a bathroom counter). For the record, terms like Universal Design, barrier-free, assistive technology, accessible and others are all important techniques and ideas used to help make living in your home easier and more enjoyable. Here are a few examples that may help you better understand how it can apply in everyday life in someone’s home. How can you make a home easier to live in for someone with poor vision? Proper lighting – Increasing the amount and quality of light, as well as location of lighting, will help them see better. Contrasting colors – You can use color several ways when remodeling. Examples are as a way to improve a person’s ability to see and access objects in the home. For instance, a dark colored counter top in the bathroom or kitchen, along with dark-colored drawer handles, makes it easier to see items on counters and easily find drawers and doors. Touch – Surfaces with different textures allow you to intuitively know where one ends and the other begins. How can you make a home easier to live in for someone who uses a wheelchair? No steps – This seems so obvious, but any type of step can impede a person in a wheelchair. Practical examples would be a step at the front door or between rooms. Doorways and halls – Doorways and halls should be wider to accommodate wheelchairs. Work areas – Appropriate counters in the kitchen and bathroom should be lower and should be “roll-under”. Meaning, a person can pull their wheelchair up-to the counter so they can sit at it to work. 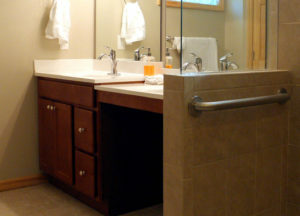 Personal care – Roll-in showers or wet rooms provide for easy access to bathing. Barrier-free living is individualized; what each person needs to access and use their home. It is a way of thinking about your home that can help you interact with it easier. (And, in ways that better suit your life.) Using it in the design of a remodeling project allows me to provide the best experience for you in your home. To help you live the life you want, the way you want, so you can enjoy it more. If you’d like to talk with me about making your home barrier-free or easier to live in overall, I’d be happy to speak with you about it.